The 1970s was the decade of the digital revolution. Computers existed long before that penultimate chapter of changing history but they came to the fore during the Age of Disco and the “Me Generation.” It was the 1970s when the world began to quantize the universe into a series of ones and zeroes. I was in Los Angeles at the time and perhaps no field popularized the acceptance of digital reality more than the field of recording popular music. For the first century of recorded music, recorded sound existed in the same way that it exists in nature: as a continuously variable energy wave, an analog sound wave. The pulses of sound in air were actually waves of air molecules impacting an eardrum or a microphone diaphragm and being transmuted into electrical energy in either case, traveling along nerves or traveling along wires. But in 1929, Harrold Nyquist of Bell Labs described how digital audio would work. It was 50 years later, almost to the day, that I engineered the first digital multitrack recording of a popular artist, Stephen Stills, to demonstrate the new 3M digital machine. Digital audio reduces a curvy wave of sound to a stair-step shaped estimation of the area under that curve and converts those infinite numbers into ones and zeroes because computers are in fact much simpler than Nature. But when viewed with an eye toward the metaphysics digital computation mirrors, we can see how our human science actually becomes an analog of reality. 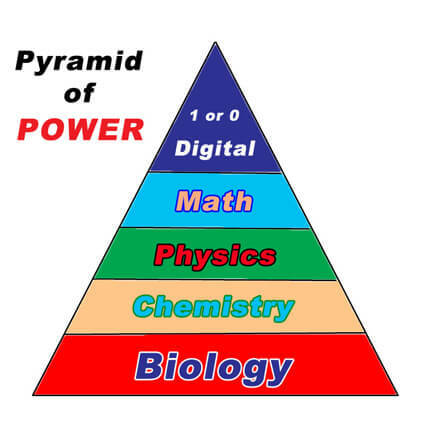 In the ‘80s, I used to teach my UCLA students about what I called the “Pyramid of Power.” It was a loosely structured reminder that as systems simplify they become more powerful and I used it to describe the power of our new, digital world. The fact that nearly everything in our experience can now be reduced to binary digits enables us to manipulate information and accomplish tasks that defied malleability only a couple of decades ago. At the bottom of my illustrative pyramid of power is the science of biology. Using biology, someone could shape their world by perhaps breeding two cows together, for example. Biology was pretty powerful by making hybrids and so on. But it was time-consuming and kind of rough. One stratum up is the science of chemistry, somewhat more powerful than biology. If we reduce elements to their chemical bases we can manipulate them even more and achieve more dramatic results than with biology. Breaking things down to amino acid chains and the chemistry of life can result in pretty powerful manipulation. Another step up the pyramid is the science of physics. Reducing a system to both matter and energy as physics does, even more powerful tools are enabled. And a step above physics is the science of mathematics. Math gets really powerful. Reducing any event in the universe to numbers gives an almost infinite power to manipulate. Mathematicians can solve and create theoretical realities that lead to all sorts of innovation. But that wasn’t the tip of the power pyramid. Next level up was the science of digital mathematics. Now our manipulative skills were refined to the use of integers including only zero and one. Only two numbers are involved rather than an infinite amount. Once our experience is reduced to a 1 or a 0 in a digital byte, we enter the world of Tron, where virtual reality blends with physical form. The blur becomes real. Duality is served by a plus or minus, an even or odd, a black or white. Digitizing information is the most powerful level we have reached so far. But it’s not the apex of the physical sciences. So what could lie beyond the power of the binary system we call digital? If the power of “2” is so dramatic, how about the power of “1”? Einstein was all about energy. At the base of Albert Einstein’s mathematical theories was what we call the Unified Field. He hunted it for years. Having defined the energetic sources in our reality as four basics, he sought to find the singular link where they all met up and shared characteristics that made them act as one. He never found it in his lifetime though he was able to demonstrate the nexus of three of them. We are teetering on the edge of that discovery but just as our digital world teaches us, you’re either “on the bus or off the bus,” “with us or against us,” “part of the problem or part of the solution,” “love or fear,” we’re either duality or unity and it’s not unity yet. We haven’t reached it but that apex of power is unity, oneness. We are so close. How can we not extrapolate that the next obvious step is what Einstein was trying to find? Removing the “them or us” quotient, the separation factor, and seeing the oneness in all areas is the final step to true transformation and the extension of our true power. Acting as separated individuals doesn’t work on any level. Living and acting with others in singularity is far more powerful than separation.